I show my reverence to each of them. I praise each one's virtuous roots. That I will become a true Buddha. The cosmos will resound with the dharma. A friend gave me a belated Christmas gift. I decided to wait and open it on the last day of the year 2006. It turned out to be the head of Buddha featured in the above photo. As soon as I saw it, I knew I would put 'Head Buddha' to watch over the sunflower seeds which I subsequently planted on 1st January 2007. 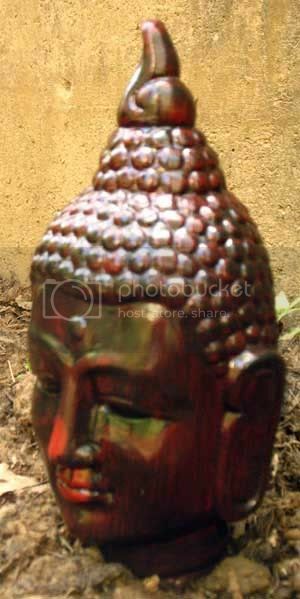 Head Buddha will protect my flowers of enlightenment from being trampled and uprooted by the over-zealous gardeners, who may mistake them for weeds when they are seedlings (as happened to some of the seedlings from my previous set of sunflowers). Metaphorically speaking, the gardeners must be the doubts, insecurities and worries which cloud the Truth. The sight of the Buddha head took my breath away as soon as my screen finished loading it.